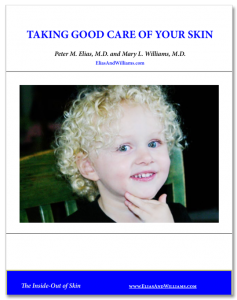 Scaly Skin and Ichthyosis (Nothing To Do with Fish Skin) - Elias and Williams: The Inside-Out of Skin by dermatologists and skin researchers Peter M. Elias, M.D. and Mary L. Williams, M.D. Scaly or flaky skin is what we see when the process of discarding the outermost cells of our skin is no longer invisible – as it should be. The shedding process has gone from being normal, that is, orderly and invisible, to being disorderly or ‘pathological’, and highly visible. The process of discarding these spent cells or ‘squames’ from the outermost layer of skin, the stratum corneum, is called ‘desquamation’. Normal desquamation is accomplished cell by cell and is imperceptible to the naked eye. The normal shedding of skin cells is aided by friction during our daily activities and is further helped by bathing. When desquamation is abnormal or pathological, the squames fail to detach from one another. And when they do finally separate, they leave in large, visible aggregates – like the clumps of scale in dandruff or the sheets of skin that peel away after a sunburn. Dry skin is another sign of abnormal desquamation. Most of us – at some time or other – have experienced one of these types of impaired skin shedding. Or we may also suffer from one of the common skin conditions, like eczema or atopic dermatitis or psoriasis, in which visible scales are often a prominent part of the disorder. Some people have scales not just in patches of dry skin but over all or most of their bodies – all the time. This often is a sign of a group of inherited skin conditions, called ‘ichthyosis’. 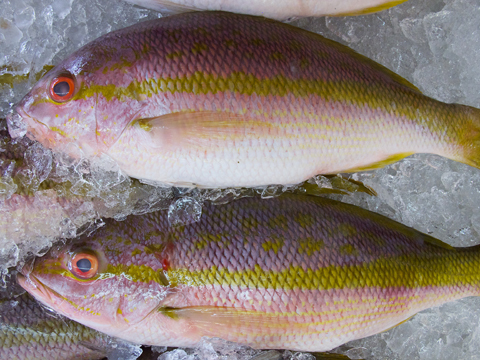 The term comes from the Greek root for fish, ‘ichthys’. The human skin condition was named more than a century ago when many skin disorders were called by what they seemed to mimic in the natural world. The scaling in ichthyosis is often most prominent over the lower legs. 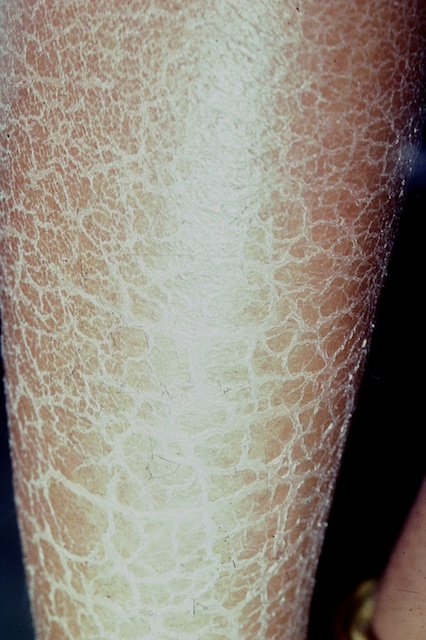 The term ichthyosis was adopted for this skin condition because the pathological desquamation resembled the scales of fish. Despite the obvious fact that the human skin condition, ichthyosis, has nothing to do with fish – or with fish skin, for that matter – the term is, for better or worse, entrenched in the medical lexicon, and unlikely to be abandoned for a more accurate and less derogatory term. Ichthyosis is not a single skin disorder; it actually represents a whole family of genetic conditions. Some are quite common. Indeed, one is named ‘ichthyosis vulgaris’, not because the condition is ‘vulgar’, in our sense of the word, but because the term ‘vulgaris’ in Greek means ‘common’. Other forms of ichthyosis are so uncommon, that were it not for the internet and FIRST (the Foundation for Ichthyosis and Related Skin Types), an individual with one of these rarer forms of ichthyosis might go through his or her entire life without ever meeting another, similarly affected person. While it may be a challenge for an individual affected by ichthyosis to deal with the skin disorder, these genetic diseases can be a real boon to scientists who wish to understand how the skin normally works. Scientists typically design experiments to study complex systems – like human diseases – by altering a single component in a model system, and then observing what happens. The result then allows the scientist to infer how that piece of the puzzle operates within the larger system. Simple (or ‘Mendelian’) genetic conditions in which only a single gene is altered or ‘mutated’ provide scientists with experiments designed by nature. Because the ichthyoses are traits in which only a single gene is mutated, they provide skin scientists with an opportunity to discover how the process of skin shedding occurs normally, by allowing them to see what happens when nature tinkers with the process. The ichthyoses have taught us a lot about the process of desquamation. One of the key players in this process are a family of proteins that make up structures that weld the cells or corneocytes’ one to another, called ‘corneodesmosomes’. The corneodesmosomes allow the outermost part of the skin, the stratum corneum to form a multitiered structure of interlocked cells. The Stratum corneum with its protein bridges or rivets called ‘corneodesmosomes’. The other key players in the process are a family of enzymes called ‘proteases’. Proteases digest proteins, breaking them up into small pieces. In desquamation, the food or ‘substrate’ for these key proteases are the corneodesmosomes. These protein bridges are gradually eaten away as the cells of the stratum corneum are pushed outward towards the skin surface by replenishments from below. By the time the cells reach the surface, the connectors have been reduced to a few, effete remnants, allowing the squames to detach from one another and to be swept away. In some of the ichthyoses, there is a problem in the delivery of proteases to the region outside the cells where their protein diet, the corneodesmosomes, reside. The epidermal cells are making the necessary proteases, but because of a delivery problem, the proteases remain trapped inside the cells. They are unable to make it out to region between the cells where the corneodesmosomes are located. This is analogous to a strike by truck drivers leaving warehouses full of finished product, unable to be shipped out to their buyers. In other form of ichthyosis, the proteases are where they need to be – that is, their delivery is unimpeded – but they are being held in an inactive or inhibited state, and unable to do their digestive work. Now it is as if the workers on the other end, those who receive the products, that are on strike and refuse to unload and unpackage them. 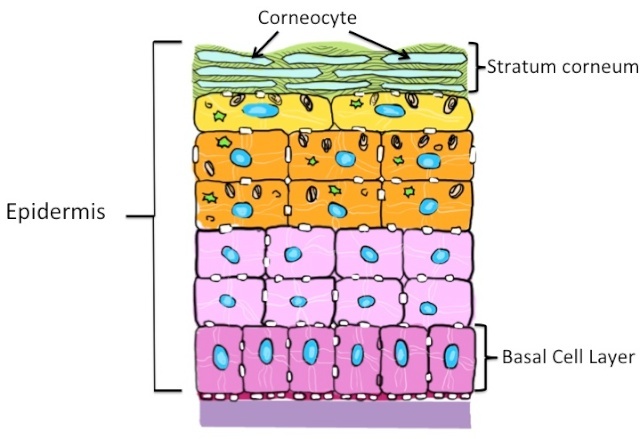 In either case, the corneodesmosomes fail to be digested in a timely manner, layers of stratum corneum accumulate and scaly skin is the result. In a number of these disorders, another problem occurs: too many cells are being produced and they are sent too rapidly to the stratum corneum, arriving in an immature sate. (That is to say, the epidermis is ‘hyperproliferative’.) The result is a flooding of the cornified cell compartment with cells that have failed to mature into fully differentiated, cornified cells. It’s a bit like a freeway at rush hour – not only is it overloaded with cars, but also the cars are poorly made and frequently experience engine problems, further backing up the traffic and exits. The hastily formed, immature cells may not have completely executed their synthesis and secretion of the proteases and protease inhibitors that mediate desquamtion. The scaling seen in the inflammatory disease, psoriasis, maybe due to this type of dysfunction. In still other ichthyoses, like Netherton syndrome, the problem is that the proteases are too active. 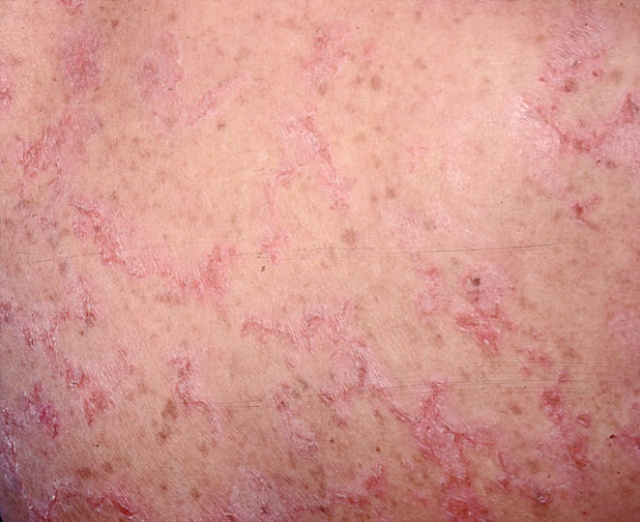 The skin of an adult with Netherton syndrome. The red ‘lines’ represent areas where the stratum corneum has peeled off due to the overactivity of proteases. This happens when other proteins – their ‘inhibitors’ – that are charged with holding the proteases in check until it is time for the squames to be shed, are inoperative. Another form of ichthyosis is due to a defect in one of the proteins of the corneodesmosome, rendering weakened bridges. In these instances, the skin is scaly because the stratum corneum is being shed too soon – abruptly, and in large sheets of cells – rather than too late, as in the previous examples. One way the proteases involved in desquamation can be held in check or rendered inactive is by altering the hydrogen ion concentration or the pH around them. A high concentration of hydrogen ions results in a low or acidic pH. Normally, the interior of the body has close to a neutral pH. But by the time a skin cell reaches the outer skin surface, the pH has become quite acidic, in the range of pH4.5 to 5.0. In several skin diseases that affect the stratum corneum, this pH balance is disturbed, and the surface becomes less acidic. Most enzymes – including proteases – have a specific preference for pH. That is, their activity levels depend on the pH of the milieu around them. Some of the proteases, prefer an acidic pH, while others are more active at a more neutral pH. When the pH of the stratum corneum is abnormal, desquamation is abnormal, too. The scaling in atopic dermatitis may be may be due to an increased surface pH activating proteases that prefer a neutral environment. This can cause scaling from premature loss of corneocytes, like that seen in Netherton syndrome. Or proteases may be inhibited by a mileau that is too acidic; a relatively common form of ichthyosis, X-linked ichthyosis, may be scaly by this mechanism. Here the inhibited proteases result in a failure of corneoctyes to let go of one another and a piling up of outer skin cells. The invisible process of normal desquamation then is like a tightly choreographed ballet. The interplay between the proteases and their preferred protein diet (or ‘substrate’), their activators and inhibitors must be perfect for the performance to come off. Isn’t it remarkable then, how often, skin successfully accomplishes this task – seamlessly and invisibly?